Tomorrow at 5:30am we are leaving for a 10 day trip across Madagascar. We’re going to the dry forests, the desert, and we are spending 5 nights at a hotel on the beach. That will be on the west coast of Madagascar so it’s on the Mozambique Channel, the body of water between Madagascar and mainland Africa. This is going to be sort of a like a vacation for us during our 10 week stay here. The weather has been great and mostly dry here, even in the rainforest. We are going to some much dryer places where it will probably be hot for a few days. Earlier this week we spent 2 nights camping in the rainforest. That trip took us deep into the forest. We made it to the campsite which was 7 kilometers away, and it was about 2 and a half to 3 hours on foot into the park. On the way there it was raining and there were some leeches out. When we made it to the camp, it was very small and on a hill. We were able to see the black and white ruffed lemur and Edward’s sifakas which are very cool to come across in the wild. We also were able to see a fossa late at night. They look sort of like cats and they prey on lemurs. It was trying to sneak into the camp to scavenge through our food. When I get back from this 10-day trip I will definitely have a lot of stories and pictures to share. This past week hasn’t included much outdoor activity other than our quick camping trip. Centre ValBio has been a great place to stay for the past 3 weeks but this trip should be an enjoyable break from the humidity and repetitive meals that are served here. I have started walking to a nearby restaurant more often because they have some really amazing food and they make very good sauces to go along with it. I’ve eaten zebu (cow), eel, crayfish, shrimp, and an American breakfast plate at a small place about 5 minutes off of our campus. It has a great view into the national park and none of the food is very expensive at all. I’m going to buy some of their homemade hot sauce to bring back home before I leave. I probably will not have any internet access for the coming 10 day trip so when I get back I will have plenty of new information and experiences to relay here. I have heard from a few people and it seems like things are mostly going well there. I’m looking forward to seeing everyone and talking about all of the amazing things that are going on here. So far we’ve had a few cool outdoor activities here. This morning we woke up at 5:30am for birdwatching. Early in the morning is the best time to see as many species as possible that are native to Madagascar, and it was a good trip. 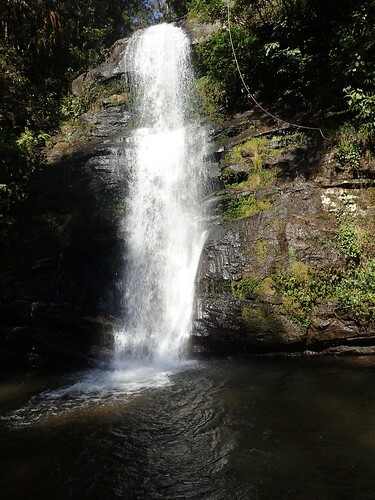 We’ve had a few walks through the trails of the rainforest which are great places to see lemurs, frogs, snakes, chameleons, birds…as well as some awesome waterfalls and far views in every direction. We also took time for a couple days to visit a few local villages in order to see what their lifestyle is like. It was a big change from anything I’ve witnessed before. They live largely without electricity, running water, heat, bathrooms, or other things that seem (or formerly seemed) like basic necessities to me. Children run around and play while adults work long days in their fields of rice or other crops. I enjoyed interacting with the kids. They get very excited about having their picture taken and then looking at a camera to see what they look like. They showed us where they live, work, eat, and play, and where they keep some of their animals. Chickens and dogs roam freely in many villages, while pigs and cows are kept under closer guard. Meanwhile, the services that CVB provide us such as food, laundry, cleaning, and even hot water now seem more like luxuries than basic necessities. After interacting with the villages in addition to having camped outdoors for nearly a week, the way I think about these “basic luxuries” and approach utilizing them has changed from an outlook of indifference to one of better appreciation. I clean my plate during meals that I previously would not have taken a bite of, then I add a few more scoops of rice from the huge bowl that each table receives for every meal. When I put on clean clothes or take a hot shower, I think about people that I have now met that are not afforded those opportunities. I drink some soda and juice at meals but I also am taking advantage of the clean drinking water at CVB, filling and re-filling my large water bottle several times each day. I am hydrated, nourished, and healthy. I don’t know if there has been a single day (it’s been about 20 days) where all 14 people on the trip have been without illness. I am maintaining my well-being without issue. Here is a small collection of pictures from CVB so far. I will have many more when we start doing more hikes around the area. I have been enjoying myself at Centre ValBio (CVB) for the 5 days I’ve spent here so far. It really is a top-notch facility with researchers and visitors alike coming from all over the world. It was built recently so everything is new and clean and very cool. The rooms (for us) are akin to those of a college dorm, but the extensive staff of the facility makes it seem just as much of a hotel as a campus. There is a cleaning crew, laundry service, cooks, guides, guards, and administration that work every day to keep CVB running. Every meal is a 3-course meal that is cooked by the kitchen staff and served on individual plates. I’ve been eating plenty of rice and vegetables and have no complaints, everything has been great. There are also a couple small restaurants within a 5 minute walk that have tasty french fries and sandwiches. CVB is situated inside Ranomafana National Park, which is home to many species of lemurs and other animals that are not found anywhere in the world outside of Madagascar. I have been lucky enough to see a pair of Greater Bamboo Lemurs, the only 2 such animals that are inside the entire national park. I’ve also seen snakes, frogs, fish, crabs, geckos, chameleons, insects, and more….all of which are endemic to Madagascar, meaning no other place on earth is home to these species. It is a very special place to live and work for the next few weeks. As nice as the buildings on campus are, I sometimes find myself wanting to separate even further from lights and electricity to spend more time camping outdoors and experiencing the environment and wildlife with zero external stimuli. We might have a few more nights of camping, I’m not sure yet. 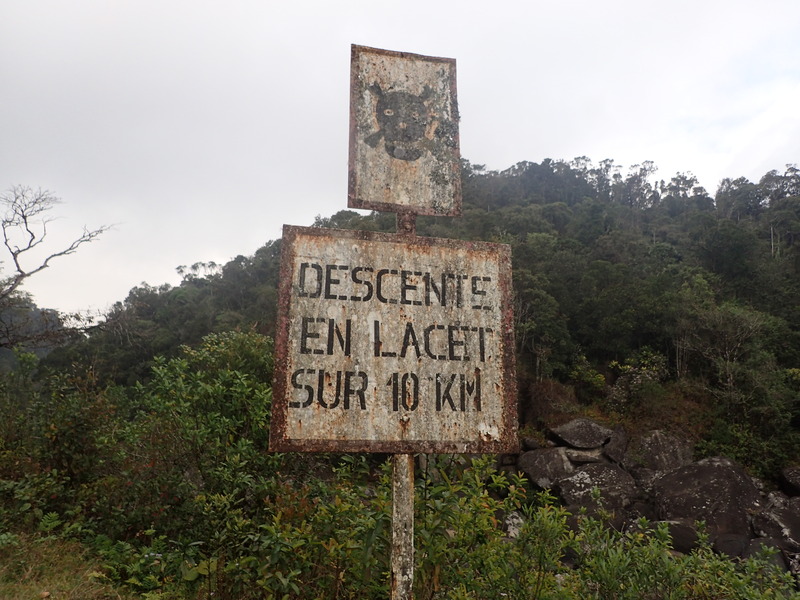 In about 2 weeks we do have a 10-day trip where we will travel across Madagascar into many different regions, including rainforest, dry forest, desert, and the beach. I’m looking forward to the voyage. Also, as many of my fellow students on the trip continue to come down with various (non-serious) health ailments, I have managed to keep entirely healthy which has been terrific. That has not limited me from participating in any and all activities. I don’t feel limited in any aspect of daily life, and it is a very free and wonderful feeling. Yesterday, on Sunday, we finally got to the ValBio research center. The past week has been spent camping out in the woods and staying one night in a village inside of Malagasy homes. 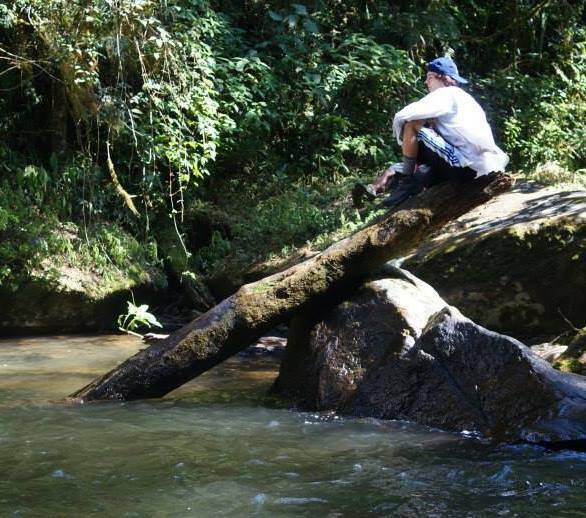 The camping trip was in the forest of Maromizaha, and we had the opportunity to take hikes each day in order to observe various species of lemurs and other animals. We pitched tents to sleep in, and our meals were prepared by Malagasy (native to Madagascar) cooks who also slept at our campground. In Madagascar, every meal has rice and vegetables, and meat, chicken, or fish is also included. Some of the students on the trip got sick about halfway through the week of camping, and they left the site to see a doctor over four hours away…I was fortunate enough to avoid whatever it was that affected them, and have been feeling healthy for the duration of the trip so far. All affected students have since recovered and rejoined our group. Now we’ll spend the rest of the trip at the research center except for a 10 day cross-country trip at some point. The landscape is amazing here and I’m excited to get out into the forest and explore! Today was Sunday, which is usually a day off for us. We had a short lecture after breakfast about primates in Madagascar and their evolution which was cool. In just a few days we’re going to be seeing some lemurs and other animals in the wild. After that lesson, we took about a 1 hour bus ride to a palace where kings and queens used to rule from. It’s all the way up on the top of a mountain, and overlooks the entire city of what is now Antananarivo (population 2 million). A lot of the city is very poor, typical houses are very small and crowded together. The views from the palace were incredible, the visibility is far-reaching in every direction. After exploring the palace grounds for a few hours, we ate lunch and returned back to our hotel. After a quick nap we went to an Italian restaurant for dinner, where I ate some Zebu (Madagascar cow) steak….it was great! Tomorrow we have a full slate of lessons on plants and animals of Madagascar. Tuesday we will set out on a 5 day camping trip where I won’t have any internet access, then we’ll travel to the ValBio research center to spend a majority of the trip there. 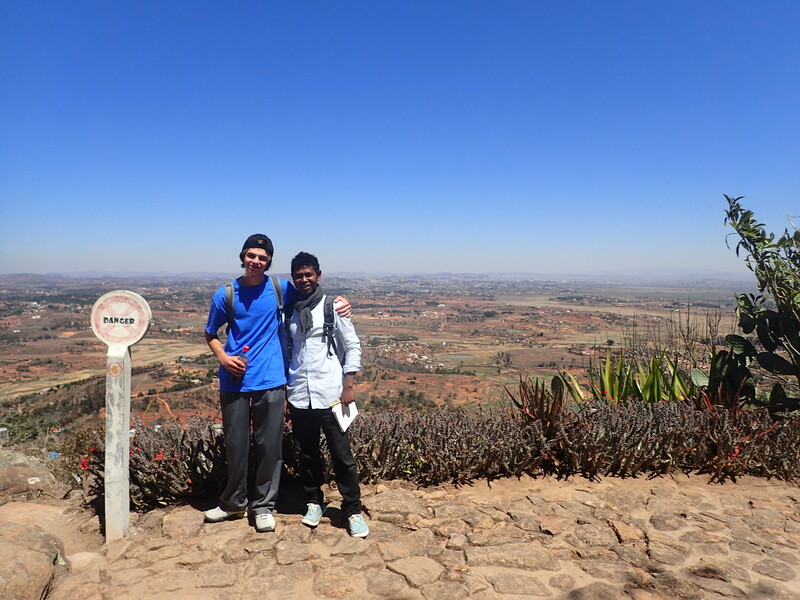 Here’s a picture of me and my Malagasy (Madagascar native) friend on top of the mountain overlooking the city! 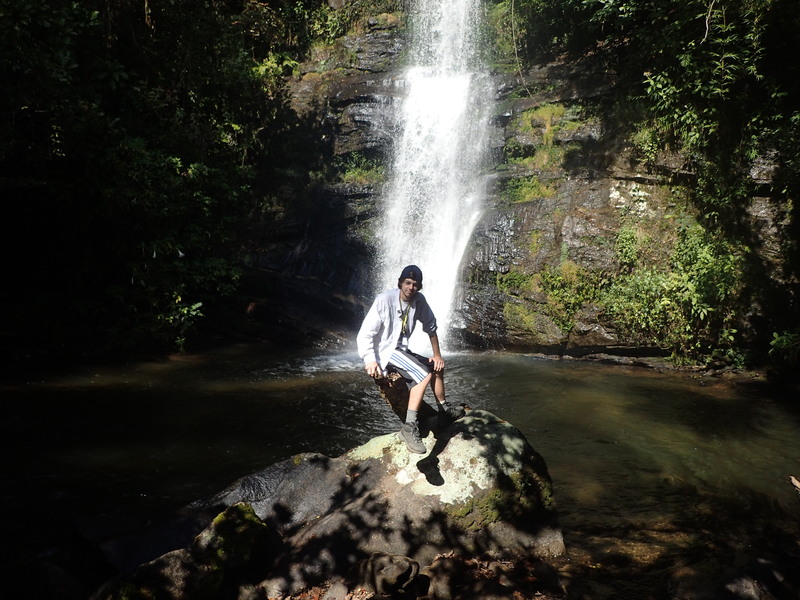 He attends a university in Madagascar and is one of 2 Malagasy students to be participating in the entire trip with us. It’s great to have some native students to help with a language barrier and to provide some great info into the culture of the country.